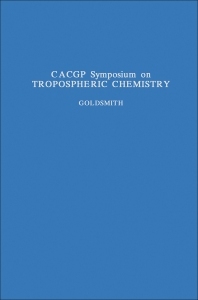 CACGP Symposium on Tropospheric Chemistry contains papers presented at the Symposium on ""Tropospheric Chemistry with Emphasis on Sulphur and Nitrogen Cycles and the Chemistry of Clouds and Precipitation"". Organized into 24 chapters, this book begins with a discussion on the trace gas and aerosol measurements at a remote site in the northeast U.S.; satellite measurements of aerosol mass and transport; and measurements of reactive nitrogen compounds in the free troposphere. Subsequent chapters explore kinetic study of reactions of some organic sulfur compounds with OH radicals; analysis of precipitation collected on a sequential basis; and measurements of the chemical composition of stratiform clouds. The book also discusses sulfur isotope ratio studies in a geothermal region; the oxidation of isoprene in the troposphere; a 2-D model of global aerosol transport; and theoretical studies of intermediates in sulfur oxidation cycle. Trace Gas and Aerosol Measurements at a Remote Site in the Northeast U.S.